On November 5, 2014, Facebook will be removing the ability to like-gate content, the practice of forcing people to like your page before they can see your content. With the ban soon taking effect, many businesses will need to re-think their Facebook strategy and their approach on how to get Facebook likes. This is a great opportunity to focus on gaining quality likes and bringing the right type of fans to your page. By eliminating like-gating, Facebook is helping remove barriers between users and the content they want to see. Your fans will have a better experience with your page without these extra hoops to jump through, and your Facebook experience will also improve by attracting a more targeted audience to your Facebook page. Why is Facebook ending like-gating? Facebook is removing like-gating is to improve the experience of their users. They want people to like a page because they actually like the page and not because they were forced to do so in order to access content or receive an incentive. Businesses can pay Facebook to show custom ads to a specific audience, with costs varying based on the number of clicks and the reach the ad receives. The use of Facebook ads allows you to hone in on your audience and target your Facebook ads to a custom audience, you can also set “Facebook page likes” as your objective. In return you’ll get higher quality likes to your page. We’ve all heard it before for a reason—you can get Facebook likes and engagement if you share relevant content that addresses the wants and needs of your target audience. Your true fans don’t need an incentive to like your page, because they’re genuinely interested in what you’re sharing. You earn these fans by creating content that matters to them, or curating content that provides value to them. It’s also important to share the right type of post. 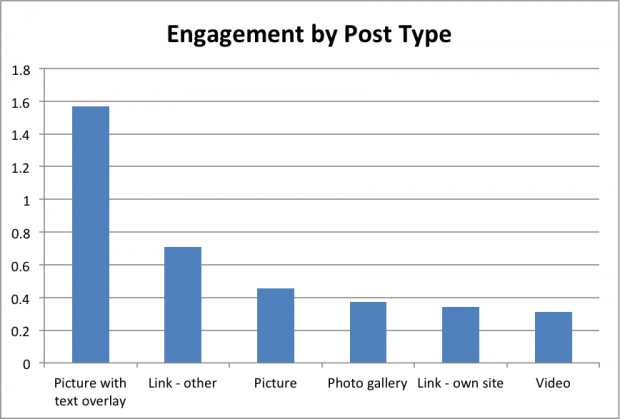 Darren Barefoot recently shared what kind of posts received the most engagement on his Facebook page to give insight on what kind of posts get the most engagement. If you can increase engagement on your content, the Facebook likes will follow. Social media should be part of your integrated marketing campaigns. If you’re launching a new product where your target audience is between the age of 18-35, promote it on Facebook. If you’re opening a new restaurant and you’re using PR to drive awareness of your opening, be sure to include a link to your Facebook page in press releases. Even though it’s indirect, integrated marketing campaigns can cause a bump in your Facebook likes simply by increasing the exposure of your page. If you have a website, you should have a Facebook social plugin that encourages people to like your Facebook page. If you have a large following on Twitter, you should encourage your followers to like your Facebook page as well. If you have a Pinterest account, you should have your Facebook page connected to it. You see what I’m getting at. Your other social networks and online platforms can help you grow your Facebook fan following. The people who sign up to receive your email newsletters are likely interested in receiving your content in other forms. Use your email list to drive Facebook likes. Providing them with an easy way to share your content with their Facebook friends should also widen the reach of your Facebook page. Hootsuite Pro can help you get more Facebook likes.